Now actually what I really wanted to do was resist organizing this area. It was a mess. A real, true mess. Paperwork was everywhere–on the desk. On top of the desk cabinet. In piles and boxes on the floor. All that stuff that I “meant” to get to and then didn’t, that was put in a pile, then the pile was moved, then something else was put on top, then it was put in a box, then it was dug through and any minor semblance of organization that may have existed was scrambled beyond recognition. . . then add on to that all the items that don’t have homes that get tossed into the mix, and the fact that we not only have my work desk (which I share with Yankee Bill) but also the kids computer. . . well. . . it really was a horrific prospect to even think about attacking this project. 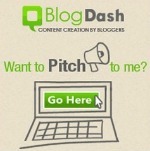 Which is why I chose it for my post–because then I would HAVE to buckle down and do it. I know, those pictures look bad, but not all THAT bad. That’s because before I even took the pictures I had lugged all the crud that was piled up on the floor out into our front room. Mostly because we had gotten a new floor safe and needed everything out of the way to get the old gun cabinet moved out of the study and the new safe moved in. THIS is the rest of the “stuff” that has to be organized–to include about 2 months worth of ironing that you can see piled up on the piano bench. . . 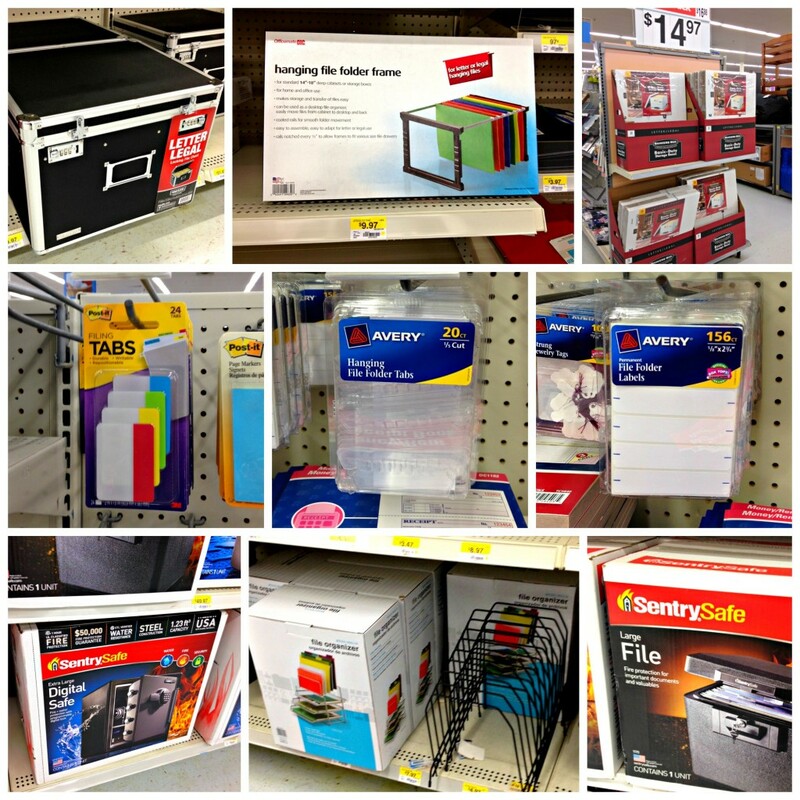 I was going to need some supplies–so off to Walmart I went. Now my biggest problem is paperwork. I need to not only go through it, but to organize and label it so I can both find what I need and file future paperwork so it doesn’t build back up into the dreaded pile again. Walmart had a lot of options. In the interest of both space and price I decided to purchase the 10 banker box set (for just $14.97), a box of hanging file folders (I wound up going back for a second box) and some labeling supplies like file tabs. Next I had to decided how to tackle the paperwork beast. I already had some files created and filled in my wooden filing cabinet. I put together 4 of the banker boxes and labeled them “Work” “Home” “Info” and “Historical”. I split the files that already existed up into those boxes. Then I set up my organizing station–in the living room in front of the TV. You’ve got to have something to watch while you are mindlessly sorting paper for several hours at a time for a couple of days (yes, this took me at least 3 sessions). To my left on the floor I placed the box/pile of papers to be gone through. In front of me were “work” “home” and “info”. On the floor by the tv was “historical” as there were far less things to be filed there (old tax returns etc). My organizing supplies (file folders, pens, labels) went to my left. To my right on the floor was a big box for trash. On the sofa beside me was a place to put items that needed to be attended to with some action. On the floor beneath the table I could place items that needed to be moved to different rooms. 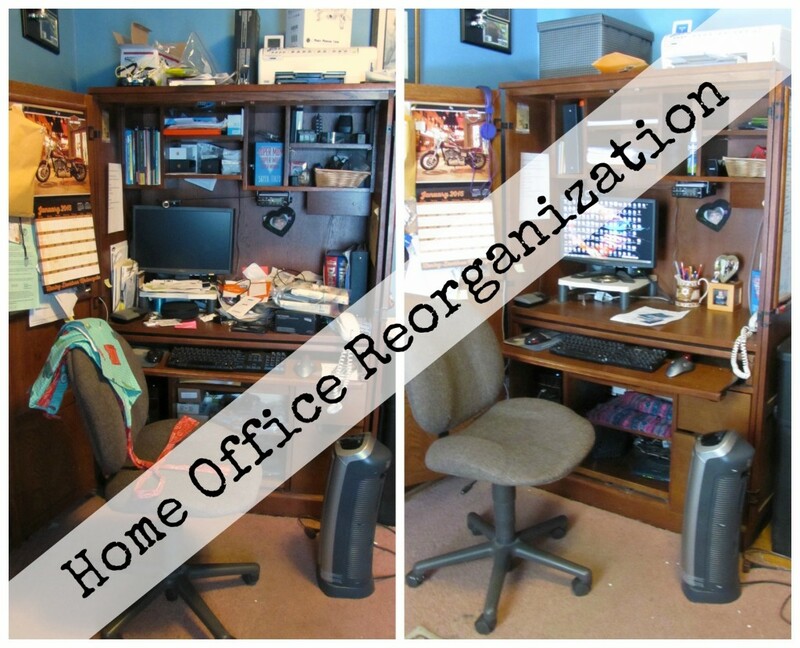 I would pick up a chunk of the papers from the box on my right, sort through them, tossing things in the trash, filing them, creating new file folders, putting them aside for action or on the floor to be moved to other rooms. This went on for several hours. For several sessions. 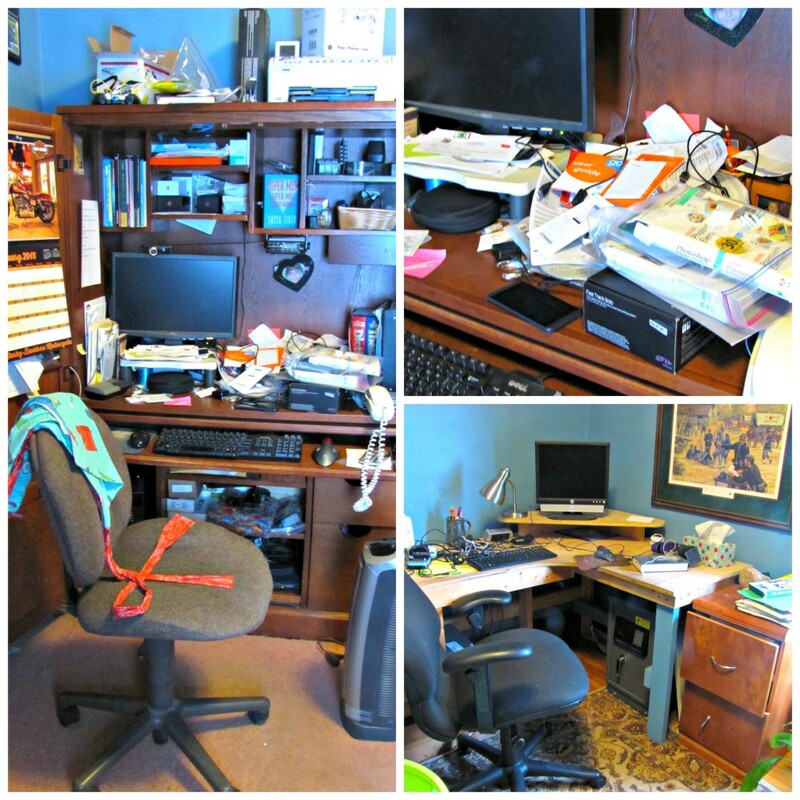 I finally tamed the paperwork beast–but I admit, the action items are not taken care of yet. The big challenge for me will be to actually do something without those and not just leave them in their newly created pile. Piles are what got me into this mess to begin with. Besides the paperwork was the “stuff” issue. Some of it had a home already and just needed to be returned. I started with accomplishing that. The big problem is that much more of the “stuff” didn’t have a clearly defined place to be–which is why it wound up in a pile. 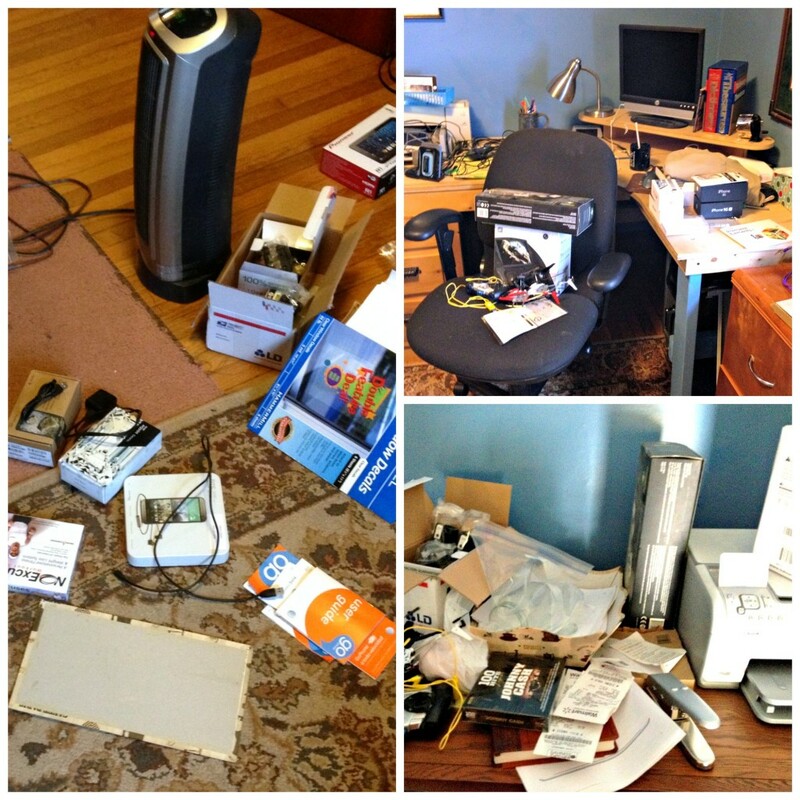 A couple of years ago (fall 2013 to be exact) I had organized the study–and created homes for all the cables, computer components and software. That organization had stood the test of time–those things were still easily found and accessed. Some of the new things that should have been added in (mostly new cables) had not joined them. A bit of box reorganization was needed–some of it had outgrown it’s space. I covered one of the banker boxes (lid and bottom separately) using a roll of wallpaper I had picked up cheap several years ago. Into that went the box of software (still organized by computer into zippered gallon bags), spare computer keyboards and mice, and a box full of all the other spare electronic things. That was placed up on top of the computer desk where it doesn’t look too bad if I do say so myself. A shoebox was filled with all my printer ink (I buy in bulk twice a year to save money) and placed under the desk, along with the box full of cables I already had–all tied into neat bundles with some spare bag ties. 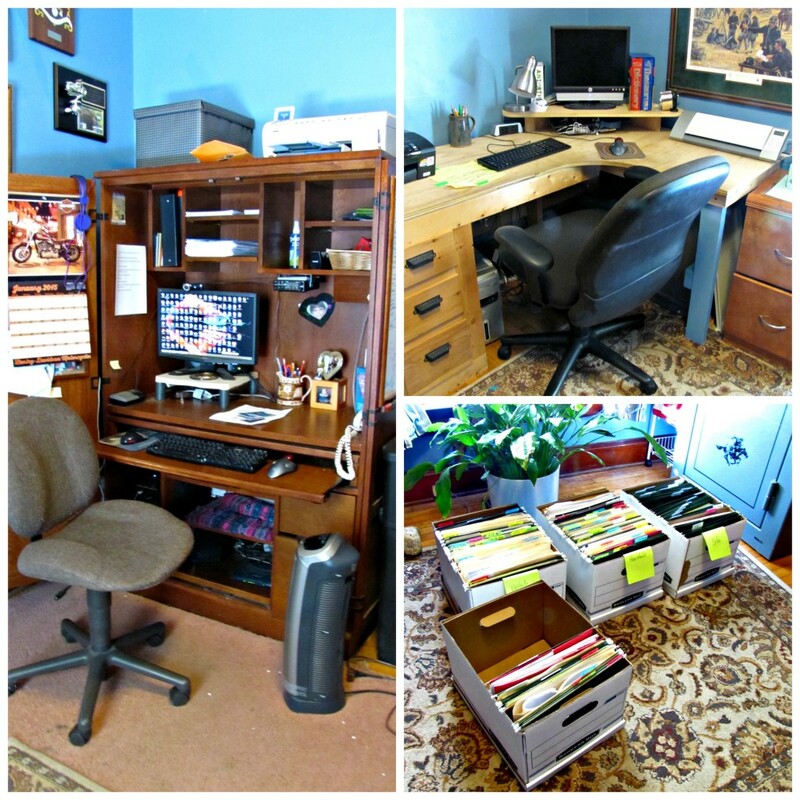 Lots of spare “office” type supplies–printable labels & business cards, index cards, extra rolls of tape, spare pens etc etc etc–all were put upstairs in the studio/guest bedroom where the rest of the school and office supplies live. Only the things I use regularly were left at the desk for easy access. Finally I was done! I still have the files in the banker boxes–some will be placed back in the file cabinet and I may have to buy a second one. 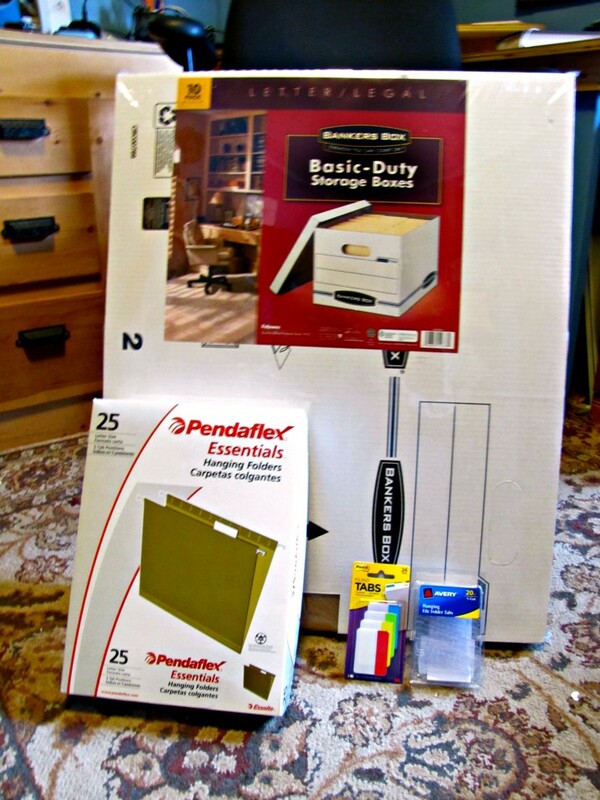 Or I may just place the banker boxes in the closet where I can easily reach them and wait on the file cabinet. Thanks to organizing, I have a much more orderly, pleasant area to do all my blogging and office work in! Now if I can just keep it from getting out of control again. It looks great Jenn! You had quite a job and it is so organized now. Those bankers’ boxes are a great interim solution! One of my biggest problems is staying organized while organizing. I know how I want my filing system to end up, but remember which pile is which category can get overwhelming, even when using labeled boxes – it’s nice to just get it into a folder right away! 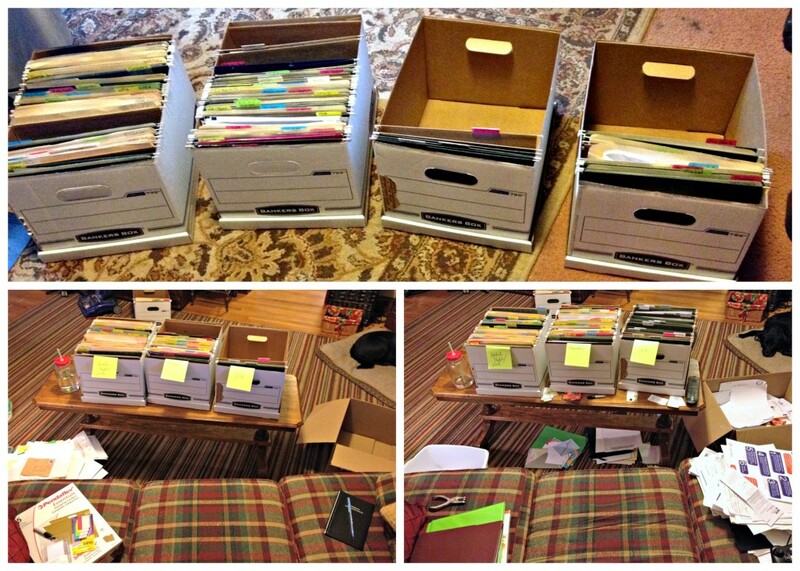 Next time I need to tackle a large paperwork organization and/or purge I’ll definitely keep this method in mind. 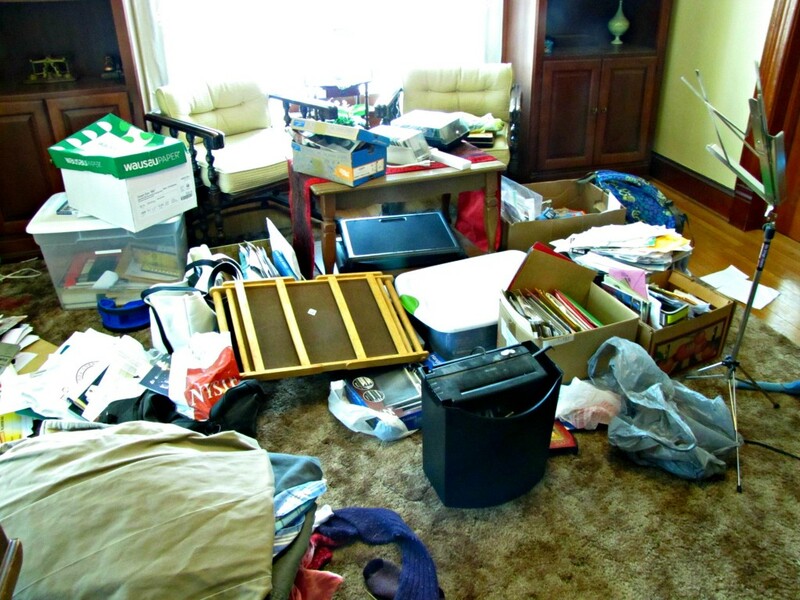 And I thought I was the only one with a lot of clutter. Looks great afterwards. I hope I can get mine to look this good. Thanks for this article. And my biggest problem is paperwork. I am so glad you have all of it laid out so I know what I need to get this accomplished. Walmart is less than a mile from my home. Time to make my list. great, great article. I really enjoy the ones based on what Walmart carries most of all. Small town. Thanks again.